Yeah, that’s me! I was supposed to have posted this article, and this picture particularly much earlier. But it ain’t a bad note to end a week on, thank God it’s Friday! 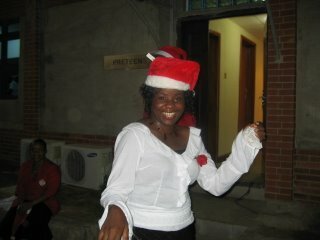 I sang at my church carol which held a week to xmas, it was an event we had spent weeks preparing for. We rehearsed so much that i lost my voice about 3 days to the carol. So i had to keep mute or just mouth the songs all through the last set of rehearsals; i got my voice back, though not fully by the D-day. In all, it went well; i tried not to sing too loudly so my voice wouldn’t crack . I heaved a sigh of relief after the programme, finally it was over. But there’s a message i’ll like us all to take with us this new year, that’s to carry what we call the message of xmas beyond the season throughout the new year. Let’s live our lives this year beyond ourselves, let’s love, give and share. Happy new year folks! I guess the festive season was wonderful with lots to eat and drink; for my partners in the exercise, hope your water therapy didn’t suffer a set-back:-)). I’m sure we’re all prepared to face the new year with determination to achieve our goals. Now, talking about goals, where i worship, we’re usually encouraged to come for the watchnight service with our written goals so they can be prayed over and we can be encouraged on how we can make our goals happen. Towards the end of 2006, i went to get the book where i had my goals written and i discovered that in the course of the year, i hardly went over those goals to check how i was doing and that some of those goals were not achieved simply because i did not keep them in view, they slipped away from my memory. I had some practical, workable goals which didn’t materialize due to lack of tracking. So i made a decision to write my goals in a diary which i take to work and open everyday. In that way, i’m more likely to keep them before my eyes. I recommend we find what works for us and stay with it. I wish you all the best as you aspire to achieve your desire! May God help us.